This was a super quick turnaround. Thursday I had a thumbnail sketch approved, but I wasn’t able to start illustrating on the finished piece until Friday morning. The concept I came up with conveys a connection to many contacts in multiple networks. Of course this meant on Friday morning I cranked out 28 different faces in my sketchbook. ( I felt like I was doing a homework assignment for the late, great Barbara Bradley at the Academy of Art in San Francisco!) About two thirds of the faces are from photo reference, about a third are invented. ( I snuck in a few friends, family and even jazz musician Joshua Redman.) The main figure holds up her cell phone into the singular connection point that all of the other networks of friends are joined to. The circles were created in illustrator, the faces and figure were sketches I scanned in and rest was painted and combined in Photoshop. Starting on the faces at 9 a.m. I turned in the finished illustration to the designer at 5:30 p.m. I can’t think of a better way to spend a day! An illustration and hand drawn map for a graphic the Contra Costa Times and Oakland Tribune newspapers that ran in Tuesday (Dec. 20, 2011) editions. The best projects always seem to land in your lap when you have the least time. This tight deadline project that came up just before I left on vacation. The subject matter was too rich to pass up going the extra mile on. 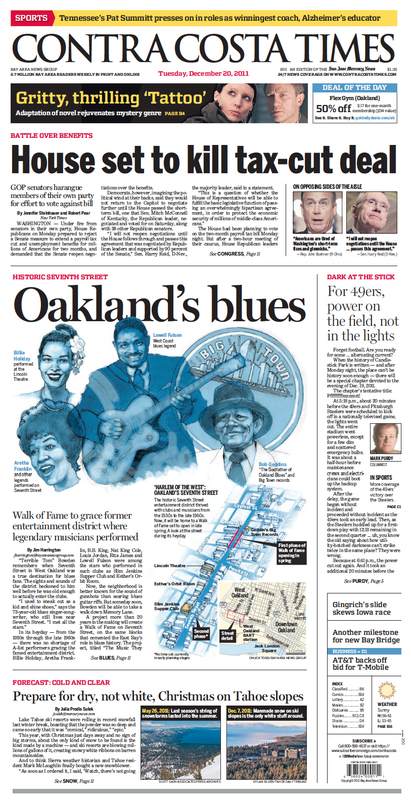 I learned a lot about the Blues history on Oakland’s Seventh Street. 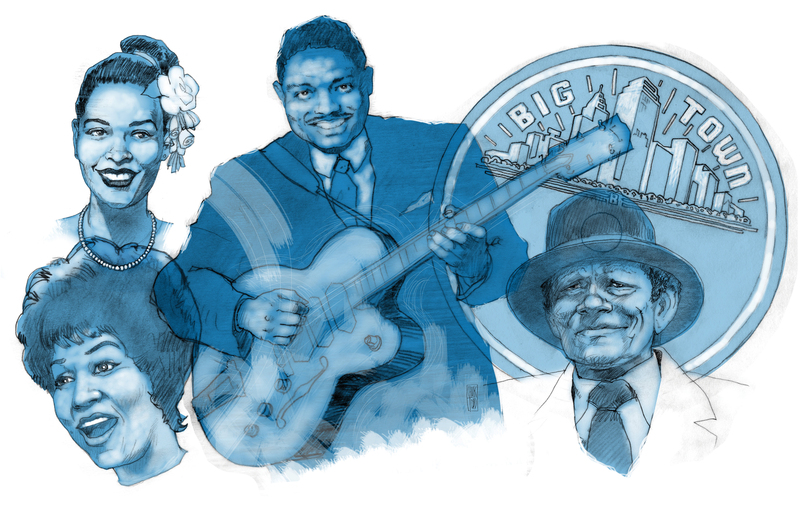 And I was able to illustrate quick portraits of Billie Holiday, Aretha Franklin and Lowell Fulson who were some of the legends that performed on Seventh Street during its heyday. Also a key figure in the blues scene in Oakland was Bob Geddins who after being inspired by west coast blues great Fulson switched his BIG TOWN record label from gospel to blues. Thanks to Bay Area News Group writer Jim Harrington for the story and helping me dig up reference materials and to Pai and Dave Johnson at Bay Area News Group for getting the project finished up, adding color and more info in the maps for publication in my absence. For this one I did separate quick sketches based on historic photos and scanned in the line art. I played with the composition and did the painting in photoshop. Very pleased with the results even for a quick turnaround. Now, I’m hungry to tackle more music and history subjects. In honor of Smithsonian’s Jazz Appreciation Month in April my friend Ed Peaco just posted on his blog about one of Duke Ellington’s works. “Harlem Air Shaft.” It inspired me to share this fun piece I did a few years back for LeapFrog. I created this several years back for a Chicago design firm for their client LeapFrog. LeapFrog does interactive, fun and educational products for kids. This was for an interactive kids magazine. Using the LeapFrog reader kids could use a stylus and click on different images on the pages and hear information on each musician. They could click on each piano key and play music. 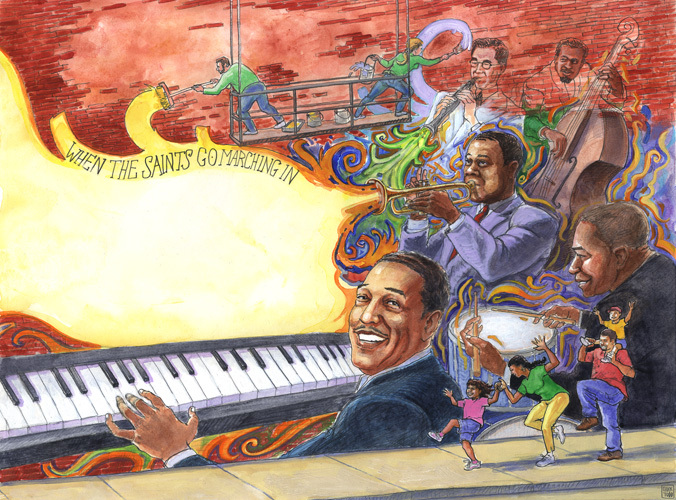 In the yellow area of the mural the music and lyrics of “When the Saints Go Marching In” it would enable the kids to select the music and hear it…or play the notes, etc. In my rough sketch all of the jazz musicians in the composition were completely different characters and fictitious…with a variety of instruments. The mural idea was part of the assignment with the family dancing in the foreground. I added the concept of the mural itself being in the process of being painted. After submitting my composition, the design firm responded that the client loves it…but wants to change this character to Duke Ellington, this one to Benny Goodman…etc. Glad they loved it. I got busy with research and turned in a real dandy on time. I got paid, but unfortunately the piece never got published by LeapFrog. They stopped publication of the magazine it was for. Too bad. But I loved how this one turned out and am really appreciative that I got to illustrate all of these jazz icons.